Since we had gotten there late, we made a decision to stay late in Luxembourg City. Unfortunately, we failed to set an alarm. With the room darkened by shades, we slept until after 8:40 am. Getting cleaned up, we wandered the square around the hotel. Given that it was Sunday morning, it was very dead... We finally settled on a place to have some coffee and pastries. From there we walked through the Notre-Dame Cathedral. We then took the elevator down to the Grund. The Grund is a city quarter located in the valley below the centre of Luxembourg City on the banks of the Alzette River. We spent some time exploring the area before walking back up to the city center. By the time, we got back to the room, it was time to check out. We loaded up the car and set the GPS for Offenburg. We traveled out of Belgium, across part of France and finally into Germany. Part of the route included toll roads and the autobahn without any speed limit. We had lunch in the Offenburg city center. After running into a lot of English speakers in Netherlands and Belgium, as we move south into Germany, we are getting more and more people who don't speak much English. This created somewhat of a comedy of errors at lunch. We all ordered the same thing which we thought was salad and sausages. As the lunch progressed, we started to think that all we had ordered was salad and bread. It turned out that we had ordered a very good chicken special with salad and bread! Part of the plan for the day was to visit Zunsweier. 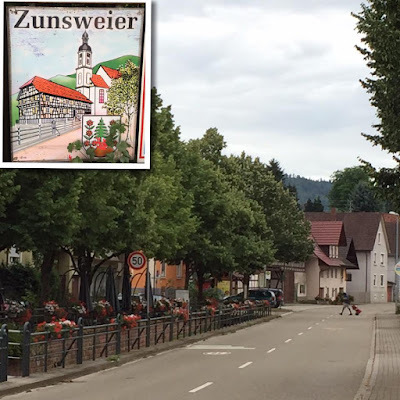 Sharon's grand grandfather left Zunsweier in the 1850's and emigrated to Philadelphia. We stopped in the village and took some pictures. From there we took a smaller back road to Frieburg. This area is the heart of the Black Forest. There is a lot of hiking and biking. I would be interested in coming back and spending a week in the Black Forest. We will be spending one night at the Hotel Oberkirch. This was another hotel on the pedestrian mall in the city center. Sharon went to find the hotel, while I waited with the car. Unfortunately, rather than sending a person to help us get to the hotel like they did in Luxembourg City, they sent Sharon back with a map. It took us some time to figure out how to navigate the streets to the hotel. By the time, I parked the car and we got settled in the room it was almost 6:00 pm. We wandered through the city cathedral. There is a picture in the cathedral of the town essentially destroyed by allied bombing in World War II, but the cathedral untouched. Afterwards, we explored the rest of the city center for about an hour and a half. We were scouting for somewhere to have dinner and watch the soccer game. We ended up back on the square around the cathedral for a cold drink. We went to dinner about 8:45 pm at Tacheles. We all had different kinds of schnitzel. We watched the France versus Iceland. France won the game by the score of 5 to 2. With a long day on Monday, we crashed early. We are going to try and get an early start tomorrow.